CD review: "Chambre Avec Vue"
Henri Salvador is French by culture and genes. Yet as a singer, he's far closer to the South American sounds of his native French Guiana than anything continental. Even when singing in French, his Guianese upbringing softens the consonants, makes it sound almost Portuguese. His natural rhythm of singing is that of the samba or bossa nova; he's far closer to Astrud Gilberto than to Edith Piaf. Regardless of whether he's more immersed in French or Brazilian styles, Salvador is possessed of a warm, welcoming voice that could turn any song in any language into aural butter. 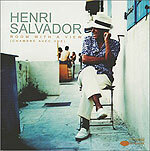 In his liner notes, Salvador  who is 80-some years old  writes that he made this album only after ordered to do so by an admirer who refused to accept his retirement! For her youthful intemperance, we should all be grateful  for Salvador shows himself a master of the romantic ballad here, a singer whose ability to distill heartache and hope rivals that of Sinatra (who was only two years older than Salvador). Even though much of the lyrics are in French or Portuguese, Salvador is a singer of such singular emotional vulnerability that you don't need to understand the words to know what he's singing about. Eighty years of living comes through these songs  and his voice is as strong, as supple as Sinatra's was in his forties. The arrangements are carefree and breezy, recalling the easy listening heyday of the 1960s. It's all very pleasant, very chic, very fun.